Aspiring authors will have the rare chance to pitch their works to some of crime fiction’s most influential names in publishing. ‘Dragons’ Pen’ is the culmination of a day-long creative writing workshop as part of Europe’s biggest celebration of crime fiction, the Theakstons Old Peculier Crime Writing Festival 2013. The workshop offers the opportunity to pitch concepts to two powerhouse literary agents, Jane Gregory of Gregory and Company and Gordon Wise of Curtis Brown, commissioning editor from Little Brown Jade Chandler, and esteemed publisher Maria Rejt of Pan Macmillan. Crime is the most lucrative genre. Blockbuster writer Lee Child sells a book a second and the genre dominates our TV and movie screens. Many of the most successful writers at work today in the genre will feature at the Theakstons Old Peculier Crime Writing Festival this July as up to 90 authors gather from around the world including Kate Atkinson, Susan Hill, Ruth Rendell, Ann Cleeves, Lee Child and Ian Rankin. Creative Thursday precedes the prestigious Theakstons Old Peculier Crime Novel of the Year Award hosted by broadcaster Mark Lawson and the official opening party for Europe’s biggest celebration of crime fiction. Attendees will be welcomed by the 2013 programming chair, Val McDermid, before undergoing an intensive exercise-based workshop with Henry Sutton, crime novelist and Senior Lecturer in Creative Writing at the University of East Anglia. A session will also be co-led by Bafta nominated screenwriter MR Hall and former lawyer William Ryan, with an interactive session also on real life crime scenarios from the Forensic Science Society. Four a.m on a wet stretch of the A1 and a driver skids out of control. Quick on the scene, Senior Investigating Officer Kate Daniels and partner DS Hank Gormley are presented with a horrifying image of carnage and mayhem that quickly becomes one of the worst road traffic accidents in Northumberland’s history. But as the casualties mount up, they soon realise that not all deaths were as a result of the accident . . . On the other side of town a house goes up in flames, turning its two inhabitants into charred corpses. Seemingly unconnected with the traffic accident, Kate sets about investigating both incidences separately. But it soon becomes apparent that all is not what it seems, and Kate and her colleagues are one always step behind a ruthless killer who will stop at nothing to get what they want. Following hot on the heels of her first two great DCI Kate Daniels novels ‘The Murder Wall‘ and ‘Settled Blood‘, Mari Hannah is back with the third book in the series and back with a bang! The opening scenes of carnage at a pile up on the A1 are ones which will stay with me for some time to come and show that Hannah has all the necessary skills to keep coming at us with great crime stories, even when it comes to leaving a good few pages before bringing her ‘tec to the scene. Sure, it can be said that having a blurb that indicates that the two incidents, the afore mentioned accident and a house fire, are ‘seemingly unconnected’ will leave very few readers wondering if the cases are going to somehow come together before long, but there are plenty of twists and turns along the way to trip even the most constant crime fiction readers. The surprises are skilfully handled and plentiful and provide a very rewarding read from an author not afraid to take risks – risks which, to her credit, are clearly paying off in a big way. And, with the great news this week that the author has secured a deal for the next two books in the series, with the next book ‘Monument to Murder’ to be published in April 2014 in hardcover. 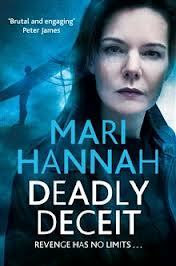 Exciting times indeed, both for Mari Hannah and for crime fiction fans everywhere. Waste no time – discover and follow DCI Kate Daniels now with Deadly Deceit. 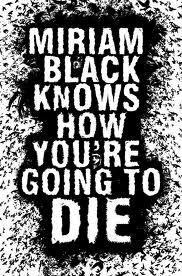 Miriam Black knows when you will die. Still in her early twenties, she’s foreseen hundreds of car crashes, heart attacks, strokes, suicides, and slow deaths by cancer. But when Miriam hitches a ride with truck driver Louis Darling and shakes his hand, she sees that in thirty days Louis will be gruesomely murdered while he calls her name. Miriam has given up trying to save people; that only makes their deaths happen. But Louis will die because he met her, and she will be the next victim. No matter what she does she can’t save Louis. But if she wants to stay alive, she’ll have to try. For some time now I’ve been following Chuck Wendig, reading his entertaining and informative writing blogs at his website terrible minds.com, listening to him on writing interview blogs at Angry Robot and The Creative Penn, and downloading his writing guide books for my kindle. 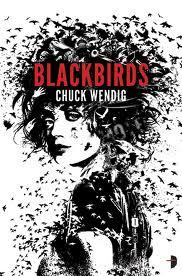 I was more than a little apprehensive about biting the bullet and checking out his fiction, but the buzz surrounding Blackbirds was too strong to resist and disappointed I most certainly was NOT. Miriam Black is a masterful character – gifted/cursed with the power we’d all struggle to decide if it was a good or bad thing – she can tell how people will die, but cannot do anything to prevent the events from occurring. From it’s great premise and stunning cover (zoom in to see the details within Miriam’s hair) you could be mistaken in thinking this is Young Adult fiction, but be warned – Blackbirds is tough, brutal, sweary and bloody – oh, and it’s excellent in all those ways too ! Now to grab a copy of the sequel ‘Mockingbird‘ ahead of the next book to also feature Miriam ‘Cormorant’. I don’t know where Mr Wendig finds the time and energy to be in so many places at once and so good in all of them, but I’m damn glad he does. Just today I received an email to advise me that very soon I’ll be able to go and collect my choice of book to give this coming World Book Night – Little Face by Sophie Hannah. And then, with a resounding second excitable ‘ping’ the following press release arrived – it’s all shaping up to be another great night of celebration of the written word and the chance to once again share the joy of reading. On 23rd April 2013 something magical will take place across the country, as the ‘World Book Night Experience’ plays out. Complete strangers will become friends, colleagues will pause and reflect, libraries and bookshops will go the extra mile to ‘stay up late’, and authors of all genres will share their writings and love of the written word with audiences of all ages. Now in its third year, World Book Night is a celebration of generosity, passion, participation and inclusion, known as the ‘World Book Night Experience’. On 23rd April – UNESCO’s International Day of the Book – many experiences will unfold simultaneously across the UK, the USA and Ireland. With major UK events in Liverpool, London, Edinburgh and beyond, a host of world-renowned writers have given their time – and their books – to inspire regular readers to harness their role as World Book Night ‘Givers’ and help spread a love of reading. World Book Night’s flagship event will this year be held in Liverpool, where bestselling authors Frank Cottrell Boyce, Jasper Fforde, Philippa Gregory, Jackie Kay, Patrick Ness and Jeanette Winterson take part in a series of free, themed literary sessions at St George’s Hall and the brand new Liverpool Central Library, in association with Liverpool City Council and the BBC. The event features an impromptu Speakers’ Corner, a Book Exchange, Poetry Waiters, a Literary-themed Café and much more. The second major event will be held at London’s Southbank Centre where World Book Night host Hardeep Singh Kohli will present a glorious night of readings designed to enlighten and entertain, by authors, poets and performers including Sebastian Barry, Tracy Chevalier, Charles Dance, Sarah Dunant, Victoria Hislop, Andrew Motion, Jojo Moyes, Alice Oswald, Elif Shafak, Lemn Sissay, Rupert Thomson and Rose Tremain. And at Edinburgh Central Library, guests will be treated to thrilling thoughts on writing with No.1 Ladies Detective Agency author Alexander McCall Smith, and a reading by BAFTA-nominated novelist and playwright Lesley Glaister, in conversation with Peggy Hughes (City of Literature). World Book Night partner, The Reading Agency, is delighted with the huge efforts libraries have made to be involved again this year, with many authors supporting libraries in hundreds of locations around the country. Independent charity The Reading Agency has coordinated the input of 2176 libraries across the UK, and supported the creation of a fantastic range of events, including supermarket visits by Amanda Smyth and Mez Parker with Coventry Mobile Library; Jessica Fox supporting Dumfries and Galloway’s Libraries Hit the High Street event; and Miranda Dickinson in Dudley. Other major library events include Sophie Hannah in Cambridge; Melvin Burgess in Bristol as part of the city’s Britain Writing: Bristol Writing programme; Blake Morrison at a newly refurbished Lewisham Library; an evening of exclusive talks, book giveaways and live music for BookAid featuring Beverley Naidoo, James Mayhew, Robert Douglas-Fairhurst and comedian Natalie Haynes at Canada Water Library Southwark; an Evening of Crime with S J Bolton in Peterborough; Ann Cleeves’ Murder Mystery Evening in Maidstone; Treasure Island themed fun in Gloucestershire; a World Book Night ‘20 books’ inspired pop-up film festival in Tameside; and in the Outer Hebrides books will be transported by Mail Bus, Aeroplane and Ferry to the furthest reaches of the islands, thanks to the dedicated efforts of staff at Lionacleit Library. Giver applications for World Book Night 2013 hit an all-time high: 23,655 people volunteered to be part of the Experience on April 23rd and from the 20,000 people confirmed as Givers, 54% chose to be involved for the first time. 58% of Givers have chosen to collect their books from a local library. Also a first this year, World Book Night introduced an application strand for charitable giving enabling more than 2,500 organisations to get books to the hardest to reach sections of society, including 90% of the prison network. 100,000 of the 500,000 books allocated have been ring-fenced for charitable and institutional giving and will be distributed in a host of venues including hospitals, shelters, care homes, community centres and prisons. This year’s titles are more varied than ever. Prize winners, bestsellers, classic tales, contemporary crime, quick reads and even a graphic novel – there is something for everyone, no matter what their interest or reading ability. Exhibit A, the new crime fiction imprint of award-winning publisher Angry Robot, is delighted to announce that, in a deal brokered by The Gotham Group and ICM Partners, major Hollywood studio Relativity Media has acquired the film rights to Richard Parker’s psychological thriller Scare Me and has signed Prison Break actor Wentworth Miller to adapt the novel for screen. Miller’s debut screenplay Stoker, starring Nicole Kidman and directed by Chan-wook Park, premiered at the Sundance Film Festival and was subsequently released to wide critical acclaim. Scare Me tells the story of a wealthy businessman who receives a phone call in the middle of the night asking him, ‘When did you last google yourself?’ He discovers a website with photos of the inside of his own home, along with six other houses he’s never seen before, inside one of which a gruesome murder has already taken place. Exhibit A acquired dramatic rights to Scare Me as part of a two book deal with Richard Parker last year. Scare Me will be published in the UK and US in paperback and eBook this May. Exhibit A, the new crime fiction imprint of award-winning publisher Angry Robot, has signed award-winning Italian author Matteo Strukul for two novels. Exhibit A’s Commissioning Editor, Emlyn Rees, bought World English rights in The Ballad of Mila and Black Queen: The Justice of Mila from Allan Guthrie at Jenny Brown Associates. The Ballad of Mila tells the story of female Italian Bounty Hunter, Mila Zago, a.k.a. Red Dread. Abandoned by her mother and violated by a gang of criminals just after they slaughtered her father, Mila is a cold-blooded killer, a deadly assassin. Brought up by her grandfather on the Sette Comuni plateau under a rigid martial code, she returns home to seek her revenge, conspiring to create a spectacular showdown reminiscent of A Fistful of Dollars. Exhibit A will publish The Ballad of Mila in June 2014 simultaneously in the UK and US in paperback and eBook. The author, Matteo Strukul, is also a well-known graphic novel writer. Together with international artist Alessandro Vitti (MARVEL and DC), he created Red Dread, a comic book series with Mila Zago as protagonist, which was awarded the Premio Leone di Narnia as “Best Italian comic book series of the year”. Matteo is also the artistic director of the Sugarpulp Festival and line editor of Revolver, a crime fiction imprint of Edizioni BD. For more information on Matteo Strukul, visit http://www.matteostrukul.com, follow him on Twitter @MatteoStrukul, or see his Facebook page. Alison Hennessey, Senior Crime Editor at Harvill Secker, has bought the next two books in Arne Dahl’s award winning crime series, adaptations of which the BBC will be broadcasting in the same Saturday night slot that turned The Killing, Borgen and The Bridge into household names. Hennessey bought UK & Commonwealth (ex. Canada) rights from Tor Jonasson at the Salomonsson Agency. To the Top of the Mountain, the book that won Arne the prestigious German Crime Prize, sees Detective Paul Hjelm and his team coming back together after the traumatic events at the end of Bad Blood to investigate a series of crimes – a man killed in a random attack in a restaurant, another blown up in high security prison, rumours of a forthcoming terrorist attack. In Europa Blues, winner of the Best International Thriller at the Dutch Book Awards, the team try and establish links between the execution of a man at Stockholm zoo, the abduction of 8 Eastern European women from a refugee centre and the horrifying murder of a professor at the Jewish cemetery in a case that will extend across Europe and back through time. Arne Dahl is an award-winning Swedish crime novelist and literary critic whose books have been translated into over twenty languages. He will be attending Cuirt, Bloody Scotland and Edinburgh International Book festivals this year. The first book in the series, The Blinded Man, was published straight into Vintage paperback in July 2012 with Bad Blood coming from Harvill Secker this July.